According to the American Dietetic Association and ConAgra Foods Foundation, as many as 70% of Americans eat at their desks several times a week. Unfortunately, eating at your desk can lead to poor nutritional choices because you aren’t usually paying attention to what you’re eating or how much you’re eating. Ideally, you’ll make the time to get out of the office at lunchtime. Not only are you more likely to eat better, but the change of scenery and opportunity to get moving is good for your health and your mood. However, if you do have to dine at your desk, there are steps you can take to make the most of it. Watch what you eat. Choose a meal that’s moderate in size but filling, and try to avoid eating while checking email or doing another distracting activity. Bring your lunch from home. Takeout lunches tend to be expensive, oversized, and loaded with fat and calories. Packing your own lunch allows you to make healthy choices about what you’re eating ahead of time. Walk when you can. 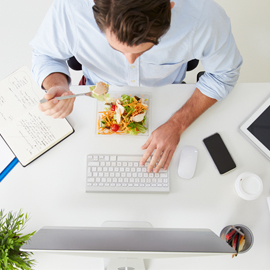 If you have to eat at your desk, find other reasons to move during the day. Try parking in the farthest spot in the lot or getting some physical activity before or after work. Even a few trips to the water cooler during the day can offer a physical break from constant sitting.